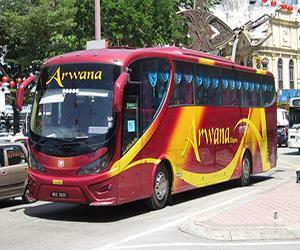 Arwana Express is the leading bus operator specializing bus service between lower Perak and Southern Malaysia Johor. Few of their famous bus services are Lumut to Johor Bahru, Manjung to Johor Bahru, Lumut to Batu Pahat, Manjung to Batu Pahat, Lumut to Muar and Manjung to Muar. With limited operator operating these bus route and proper management of coach fleet, Arwana Express quickly emerges as locals' first choice to travel between these two towns. Arwana Express provides 2 daily bus from Lumut and Manjung to Muar and Batu Pahat and 4 daily bus from Lumut and Manjung to Johor Bahru. The bus departs from Lumut and Manjung will go to Muar and Batu Pahat. The estimated trip duration is 8-9 hours. The buses provided are in excellent condition and fully air-conditioned. 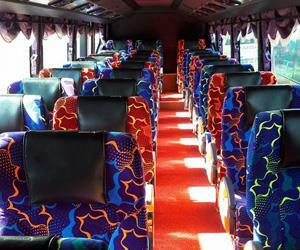 The VIP coach are installed with 30 seats and they are neatly arranged 3 seats in a row. The reclining seats and spacious legroom ensure a comfortable journey for their passengers. Arwana Express has joined BusOnlineTicket.com to offer online bus ticket booking. You can now book your bus tickets from Manjung or Lumut to Batu Pahat and Muar online. Apart from saving the time and cost, you can also secure your tickets in advance to avoid disappointment especially during weekends and public holidays.